We don’t debate nearly as much as we should on what a Socialist society would look like, but if I had to guess, it’d probably be pretty similar to the administration of Jose Mujica. 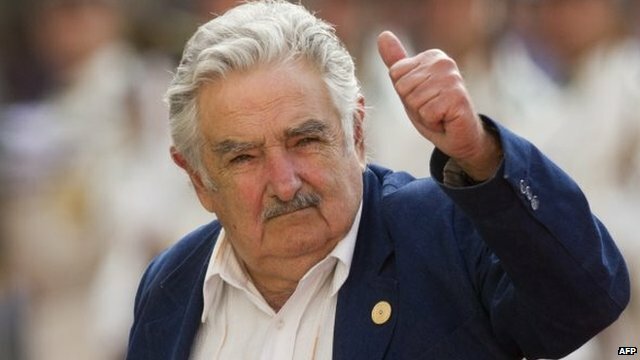 Uruguay’s current leader has been dubbed by some as “the world’s poorest president”. Swiftly gaining acclaim as news of his actions and lifestyle spread across the internet, Mujica has been joined the all-too-small ranks of “honorable politicians”, perhaps filling the void left by the death of Nelson Mandela in December of last year. In a world where poverty, inequality, and economic injustice are increasingly recognized, Mujica stands out for his shocking rejection of the pomp and circumstance that accompany power. Mujica drives a beat-up Volkswagon Beetle, and lives with his wife on a chrysanthemum farm on the outskirts of the capitol with their three-legged dog, Manuela. Living off of 12,000 dollars, and donating 90% of his presidential salary to charity, it sounds almost more like the setting for a political fairy tale than a reality.